Mill the grains and sift to obtain 250 g of high extraction flour. Save the bran for dusting the baskets as well as for another use. Place the hulless oats and the wild rice in a heatproof bowl and add 190 g boiling water. Cover and let sit overnight. 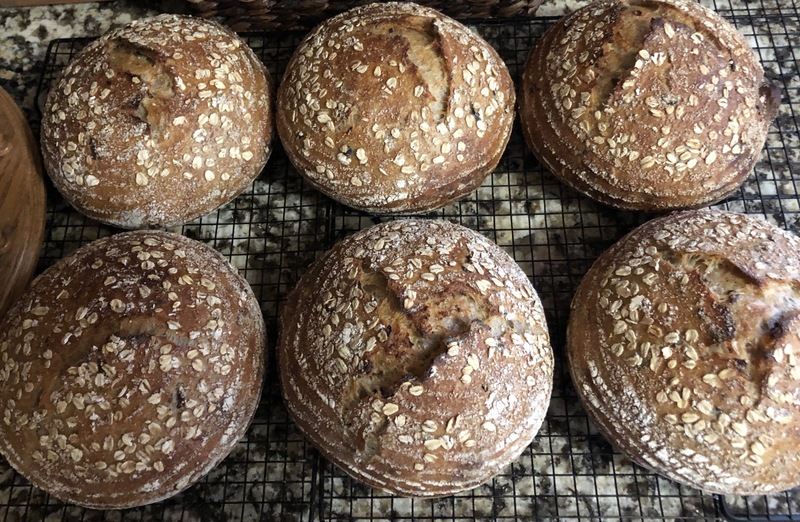 Before going to bed, feed the levain 36 g of water and 36 g of AP flour flour including any left over high extraction flour. Let that rest in a warm place overnight. Feed the levain 72 g of filtered water and 72 g of AP flour and let rise 4-5 hours in a warm spot. Drain the wild rice and hulless oats. Add fresh water to cover by an inch and cook gently until the wild rice has bloomed. I cooked it for about 15 -20 minutes and then let sit until all wild rice grains had split open. * Drain well. * Cover and set aside to cool. Cook the barley flakes and the rolled oats in the 175 g of water until the water has been all absorbed. This was very quick! Add to the hulless oats and wild rice. Two hours before the levain is ready, mix the water with the flour on the lowest speed in the bowl of a stand mixer until all the flour has been hydrated. This took a couple of minutes. Autolyse for at least a couple of hours. Once the levain is ready, add the salt, the yogurt, the add-ins and the levain to the bowl. Mix on one for a minute to integrate everything, mix on speed 2 for 5 minutes. This dough is wet! I even had thoughts of adding flour! Do 4 sets of folds at 30 minute intervals, then switch to hourly folds for another 2 sets. The dough really came together with the folds. It was amazing to see! Place the dough in a cold fridge for 3 hours. The dough rose about 30%. Tip the dough out on a bare counter, sprinkle the top with flour and divide into portions of ~810 g. Round out the portions into rounds with a dough scraper and let rest one hour on the counter. Do a final shape by flouring the rounds and flipping the rounds over on a lightly floured counter. Gently stretch the dough out into a circle. Pull and fold the third of the dough closest to you over the middle. Pull the right side and fold over the middle and do the same to the left. Fold the top end to the center patting out any cavities. Finally stretch the two top corners and fold over each other in the middle. Roll the bottom of the dough away from you until the seam is underneath the dough. Cup your hands around the dough and pull towards you, doing this on all sides of the dough to round it off. Finally spin the dough to make as tight boule as you can considering how wet this dough is. Sprinkle bran and oats flakes in the bannetons. Place the dough seam side down in the bannetons. I debated leaving the dough uncovered for the night but decided to simply sprinkle some extra flour on top and then covered it with bowl covers. Let rest for a few minutes on the counter and then put to bed in a cold (38F) fridge for 9-10 hours. Cover the pots and bake the loaves at 450 F for 30 minutes, remove the lids, and bake for another 20 minutes at 425 F. Internal temperature should be 205F or more. 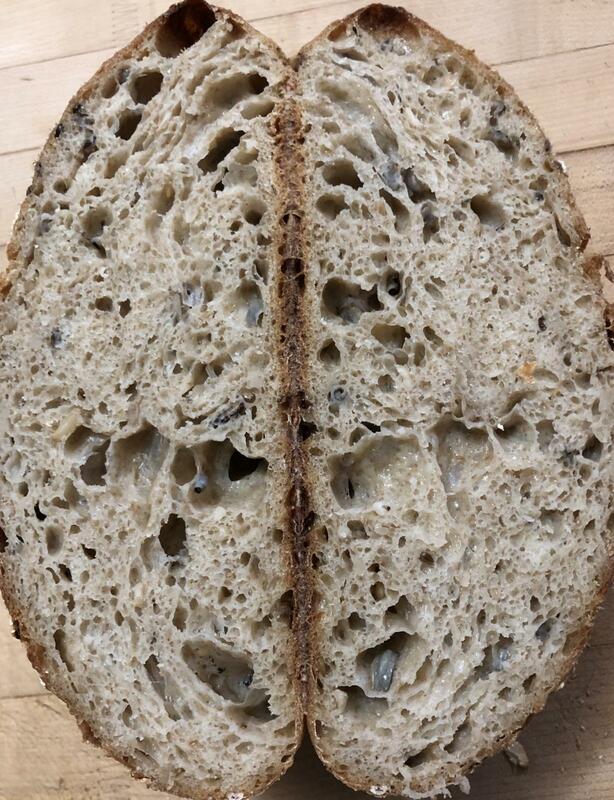 I got a decent rise considering the hydration. Note to myself: Reduce the water by at least 50 grams if not more! From the photo alone. Not one, not two but a load of perfect loaves. How you do it I do not know but each one turns out as if you have it your sole attention. These are far from perfect but they’ll do.